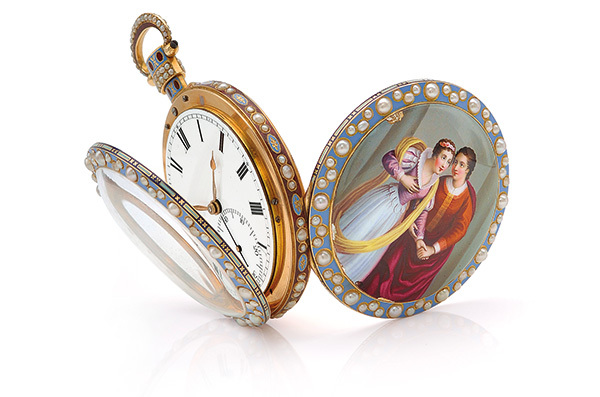 An antique pearl, enamel, and gold duplex pocket watch by Bovet, London, early 19th century. So exactly what is it that makes a nearly 200-year old pocket watch worth the price of a mid-level German sedan? ‚Äì age, artistry and rarity are all factors coupled with prestige and status. This fine example of export driven finery was created by Bovet in the early 19th century and is a wonderful example of artistic merit and workmanship following the expectations and desires of a particular niche market. and exclusions. Loosening of trade restrictions that previously posed barriers helped establish lucrative markets in emerging zones. Sound familiar? Edouard Bovet had spent a few years as a watch repairer in Canton, China and went on to incorporate his own company in London in 1822. With original connections to the watch trade in Switzerland, he made good use of the British arm of the company to dominate sales and entice buyers in China. The pocket watches were designed explicitly and expressly for the export market with a focus on particularly Western motifs and details. Classical scenes, themes and portraits like the one illustrated here evoking romantic star-crossed lovers reminiscent of Romeo and Juliette, medieval lords and ladies, and fairy tales appealed to Chinese aristocrats. 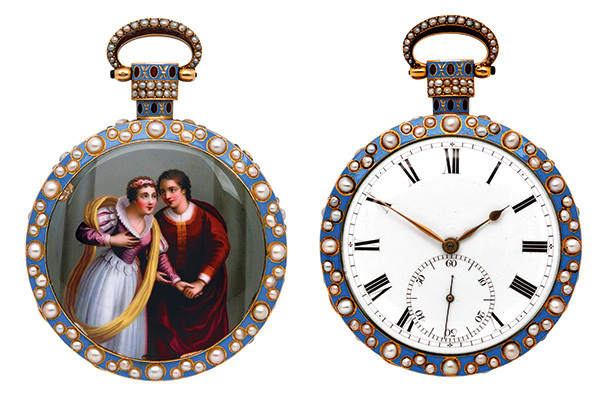 The watch pictured has a circular case and depicts an attractive romantic couple in neoclassical dress painted in polychrome enamel, and the reverse has all the requisite workings of a practical timepiece of that era – Roman numerals, subsidiary dial for constant seconds, and a keywound manual movement. It‚Äôs accented all over with blue, brown, red and white champlev√© enamel details and inset with split pearls. As should be expected, it shows a bit of wear and tear from the last century with some surface scratching and loss to the enamel. More importantly, it‚Äôs signed Bovet London 274 and the large 57 mm case is numbered 1330. Give or take a few hundreds of dollars depending on the wildly fluctuating market, the 18 karat yellow gold piece weighs 141 grams and has a metal value of around $5,000. This model sold at auction in late 2012 for $65,000 to a very pleased bidder in the trade who recognized the rarity at a bargain price. Also last year, a model decorated with a mandarin duck originally purchased in 1835, sold to the current owner of the House of Bovet for a rarified 363,000 Swiss francs, [approximately nearly $400,000] returning from whence it came after 177 years. Bovet‚Äôs current line includes made to order watches for clients interested in spending something in the range of a million dollars for a one-of-a-kind piece. More down to earth selections are priced for mere mortals and with their accuracy-promoting tourbillon anti-gravity mechanisms, especially the skeletonized models, these styles are well respected in the industry and by purchasers. One distinctive wristwatch is designed in collaboration with Pininfarina of Ferrari fame; the Cambiano, as it‚Äôs called, is a contemporary riff on a classic pocket watch design – its case is detachable from the wrist strap and converts to a pocket watch or a mini version of a desk clock. Artistic merit has long been prized by the company and is apparent in the painted portraits on mother-of-pearl dials from the current Fleurier series while the notion of exotic has done a 180 degree turn from Western themes to far Eastern. Chinese and Japanese motifs like koi and pandas, to ladies from Shanghai and partially clad geishas, are rendered in bright polychrome enamels to appeal to a broad base of collectors who appreciate the charms of cuteness and erotica. But of course spectacle isn‚Äôt confined to the 1800s. In our very own 21st century, the word ‚Äòunique‚Äô often gets overused and misused but in this case it‚Äôs actually an accurate description. baguette-cut diamonds and the crown itself weighs in at 1.06 carats. That‚Äôs an impressive feat of counting skill, if nothing else and it took more than a year from concept to finish. Those pop culture phenoms, the entertainers Jay-Z and Beyonce are the proud owners of this ‚ÄúBig Bang‚Äù model but maybe they should change the name to ‚ÄúBIG BLING‚Äù. It was a birthday present from her to him and it certainly makes lurching into middle-age a touch more bearable. And all this time, parents have been encouraging their kids to go into medicine or law! Maybe 200 years from now, timepiece connoisseurs will look upon Hublot‚Äôs well-publicized diamond excesses as an example of the exotic local market, and the esteemed but lesser-known enamel marvel from Bovet will be quietly marking its 400th anniversary: unique curiosities, existing to be enjoyed. What constitutes worthiness, like beauty, really is in the eye of the beholder.